Today, I had breakfast at the Front Porch. I couldn't find an empty table so I asked Lyla (whom I met earlier in the week) if I could join her. She was delighted to have company because at home, she may go a week without seeing anyone. Lyla told me how she worked up an appetite after exercising in the Athletic Club for an hour before breakfast. She used the weights and the treadmill. Lyla, a small framed woman, at the height of approximately 5'2", is on this cruise celebrating her 82nd birthday. Her wit, charm, and light-hearted attitude had me from the first day. As we continued to talk, she mentioned how the staff was so friendly and helpful, and how the staff's attitude must have worn off on the passengers because all the passengers were just as cordial. What perception! I think Lyla was quite right. I've watched the staff these last few days and have appreciated their attention to the needs of the passengers. There is a Chinese family on board who does not speak much English. From what I can tell, they seem to be having a good time. 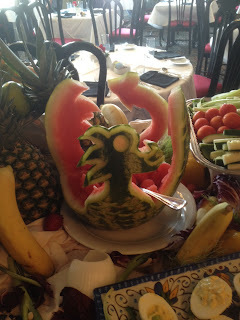 In an effort to share some hospitality, one of the kitchen staff carved a dragon out of a watermelon and it was on display at the lunch buffet. Another time I witnessed a couple in their 80's having lunch. They finished the main dish and were ready for dessert. The maitre d' went over to the self-serve dessert table, picked up the tray of mini cupcakes, brought it back to the table, and presented the selection to the couple. Once they made their choice, he returned the tray to the table. It's refreshing to see that a little bit of hospitality goes a long way. Our port today was Point Pleasant, West Virginia, otherwise known as the first battle of the Revolutionary War. 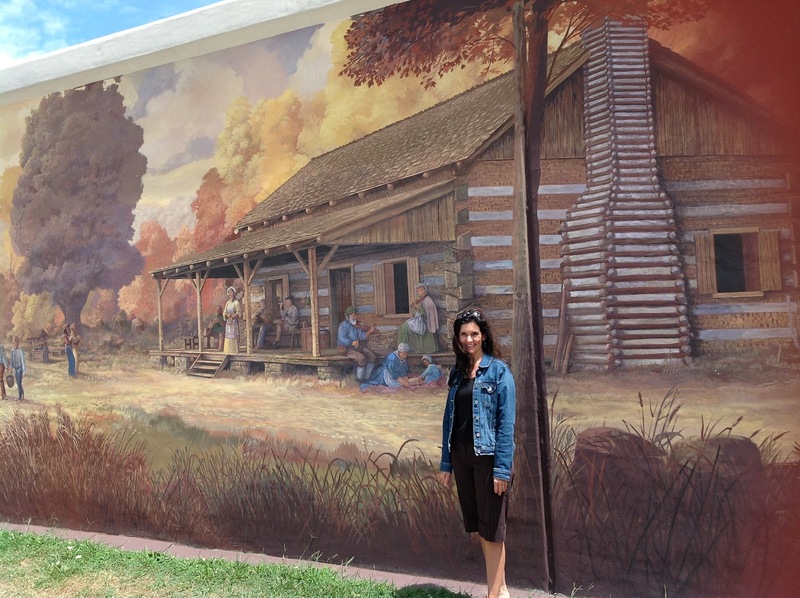 Beautiful, floodwall murals depict scenes of local history. What a way to enhance the scenery as well to preserve the past. Executive Chef Regina Charboneau, presented a class today on Entertaining Southern Style. When entertaining, remember to enjoy your guests. Don't be so wrapped up working in the kitchen that there isn't time to visit. Leave the dishes for later. 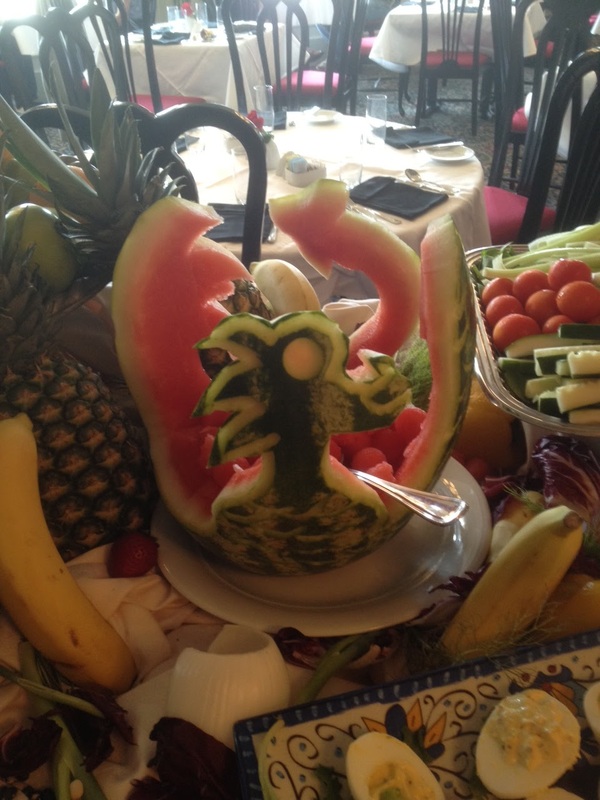 Consider having a self serve buffet so guests have a choice in what they want. Remember that it's okay to purchase pre-made foods to lighten the load of entertaining. Thanks, Regina, for helping us to remember to keep it simple. To learn more about Chef Regina Charboneau, visit her webiste www.reginaskitchen.com. 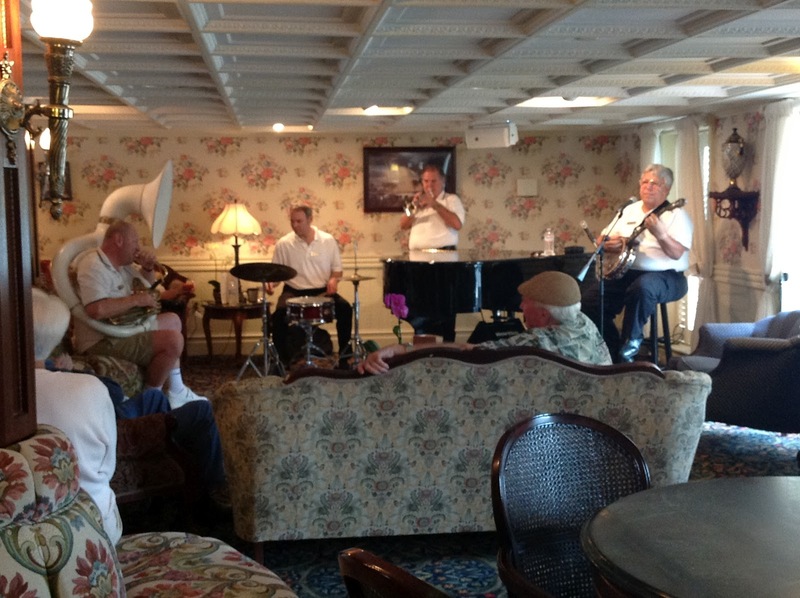 Other highlights today included the jazz band brunch, featuring traditional New Orleans Sounds and a tour of the Pilot House. 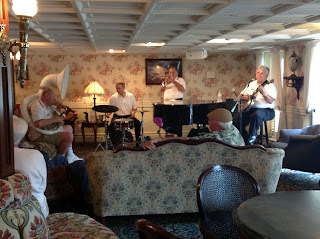 It's been another fun-filled day aboard the American Queen. 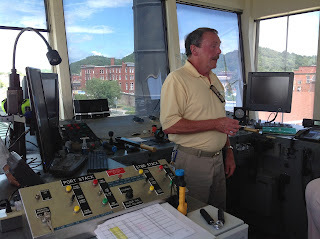 For additional information on cruising the American Queen, contact Janelle at janelle@lifesrudder.com.